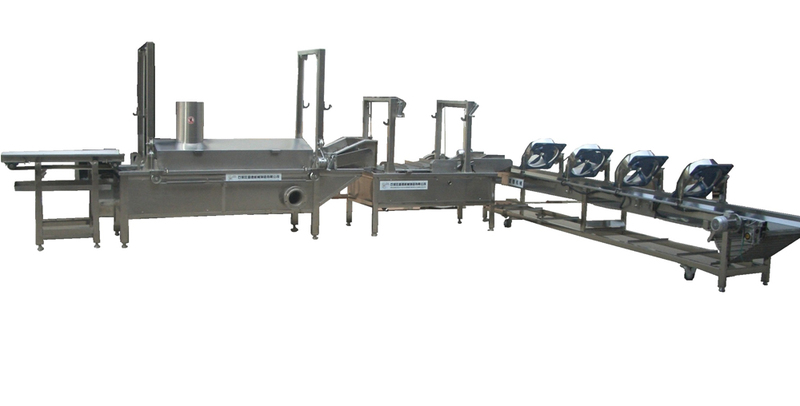 The pressure frying machine network as a single conveyor belt, the discharge end of Conveyor to enhance the network with the structure of the low injection oil, frying oil flow faster. the frying of the liner made of 304 stainless steel pattern plate mosaic. Bladder pressure test carried out after welding to ensure the pot does not leak. fry shell 304 quality stainless steel mosaic. the frying of a rectangular frame made of stainless steel welded pipe. the frying of stainless steel seamless pipe, heating pipe welded together. Heating pipes below the surface of the power requirements of the State, can greatly alleviate the high temperature caused by the scaling phenomenon. Heating system made of two tranches of control. the frying has ultra-high temperature alarm and the alarm level, when the oil temperature is too high or the oil level below the work surface when the oil alert sound, caused by the negligence of workers to work to avoid the danger. in order to reduce heat loss, bomb fitted between the liner and shell silicate insulation materials, insulation materials, the use of laminated seal. frying machine adopts frequency control, frequency of cornwall. for the user-friendly operation, with a separate control box.